To Score well in GATE Exam, an aspirant must have the proper strategy about How to Crack GATE Exam? To qualify GATE you should have proper Study plan so that every concept will be cleared to you before appearing in Exam. As every subject is not of equal priority, you should read paper according to their weight age in the exam. 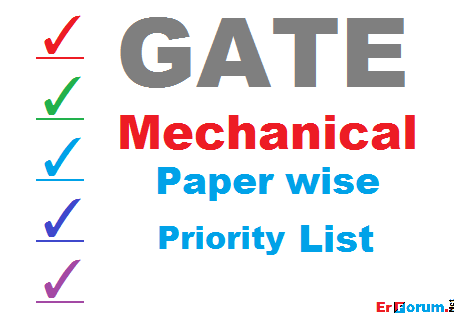 This list is prepared by observing the importance of paper in GATE Mechanical exam [on the basis of the number of Question asked] of last 10 year. Here we categorized GATE Mechanical subjects into 4 groups namely A, B, C, and D.
If you want to join any PSUs or to get admission in M.Tech at any IITs or ISM you can’t ignore any subject. You should focus on all subjects keeping in mind the importance of the paper. Means you should read Group ‘A’ and Group ‘B’ subjects in depth. And Group ‘C’ & ‘D’ with slightly less priority but can’t ignore any subject. If you want to Join M.Tech at any NITs you should focus and do an in-depth study of Group ‘A’, Group ‘B’ subjects and Group ‘C’ subject with less priority. Read Group ‘D’ only one time two week before the exam. If you just want to qualify in GATE you can skip Group ‘C’ and Group ‘D’ subjects but read at least Group ‘A’ subjects thoroughly.